Luca M. Damiani is a media artist-designer, photographer and digital producer. He is an Associate Lecturer for BA (Hons) Graphic and Media Design at London College of Communication. Luca practices internationally in the fields of the Arts, Digital Media and Visual Culture. He works and experiments with creative techniques such as digital tech, illustration-animation, photography, coding and mix-media. Using a multi-methodological approach, Luca explores artistic processes re-considering the combination of methods. Luca's career spans arts education, film production, photo-documentary, digital art curation. 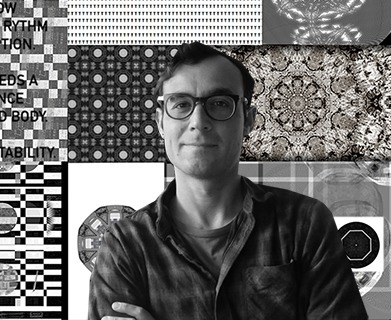 His ongoing research-based practice looks at various areas of applied art and design, with the main focus on technology, digital art, neurodiversity and human rights. Luca is a published artist-author of several books and papers – his work is actively exhibited and showcased. In his research and practice, Luca has collaborated and worked with many institutions and leading organisations such as Computer Arts Society, Mozilla Foundation, VFX company Framestore, NESTA, The Walt Disney Company, NGO Amnesty International, BBC, TATE, V&A, Thames & Hudson. Currently, he is also a Digital Producer at Tate and Art&Design Associate with Mozilla. Luca has been teaching at LCC since 2014. His teaching emphasis focuses on concept development, hands-on making, process analysis, cross-connection analogue/digital and self-directed projects. He is also very active in off-site learning with students, running digital tech workshops, critique sessions, hack-days. Participation, reflexivity and active engagement play an important role in his pedagogic approach.